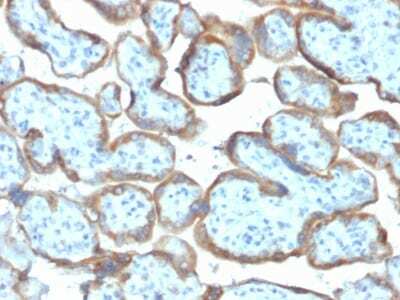 This antibody recognizes tissue inhibitor of metalloproteinases-2 (TIMP-2), which inhibits the proteolytic invasiveness of tumor cells and normal placental trophoblast cells. HeLa cells. Normal Placenta. Breast, Colon, Endometrial, Prostate or Ovarian Carcinoma. 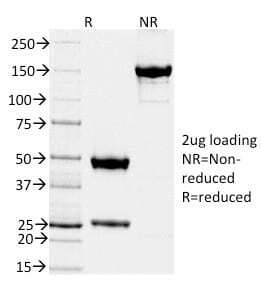 This antibody recognizes a protein of 21 kDa, identified as tissue inhibitor of metalloproteinases-2 (TIMP-2). It is closely related to TIMP-1 and shows the highest binding affinity to both the latent (pro) and active forms of 72 kDa Type IV collagenase (also known as MMP-2 or gelatinase A). It also has affinity for the active form of 92 kDa Type IV collagenase (also known as MMP-9 or gelatinase B). TIMP-2 inhibits the proteolytic invasiveness of tumor cells and normal placental trophoblast cells. Catalog number key for antibody number 2044, Anti-TIMP2 (TIMP2/2044) The prefix indicates conjugation, followed by the antibody number and size suffix. Murray et al. 1998. Gut. 43(6):791-7.|Jeffery et al. 2009. Histopathology. 54(7):820-8.